On this day in 1879, the post office at Caddo Mills was opened. The town is located at the intersection of State Highway 66 and Farm Road 36 near Caddo Creek in Hunt County. In 1870 I. T. Johnson and Henry King had built a gristmill a mile west of the present townsite. Shortly thereafter, a store opened and a community developed. Residents referred to it as Caddo Mills, after Johnson and King’s gristmill. In the early 1880s Caddo Mills had 100 residents, three churches, and a school. The Katie Railroad reached the town in 1886. By 1892 the number of businesses had doubled and the population was 500. The Caddo Mills Banner began publication in 1897. The State National Bank opened in 1905. The town was incorporated in 1940, and by 1990 the population was 1,068. In the early 1950s the Chaparral Roadster Club began working with city officials to convert the abandoned WWII military airstrip for drag racing. 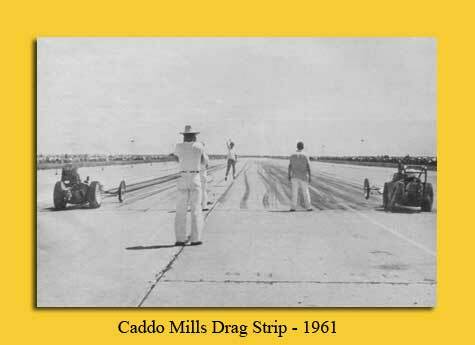 This converted airstrip was the first NHRA sanctioned drag strip in Texas. Racing no longer takes place at this location, but the Redline Raceway nearby continues the Caddo Mills racing tradition.